Most pertinent to my own preferences is the increasing popularity of colored tights. The anime Kemono Friends features multiple characters in tights, starting from the protagonist, Kaban. The third episode introduces the Japanese Crested Ibis, who wears bright red tights. After the broadcast of that episode, artists specializing in tights produced artwork of her in large numbers, and again with the debut of the Silver Fox and Ezo Red Fox in episode nine. I believe the popularity of Kemono Friends can be credited for the most recent increase in popularity of tights in colors other than black, white, and beige. Other trends that have seen increased frequency in 2017, as described in the infographic, are wet tights and a focus on the sole of the foot. The former has been accompanied with tights under swimsuits, which was once a rare novelty but now appears with some frequency. The imagery is similar to the classic bunny outfit with tights, but the swimsuit allows the tights an opportunity to become wet. A variation of this is the female gym uniform with tights under bloomers. As of this writing, there is no scientific consensus as to why the foot fetishism manifests nor why it is the most common fetishism reported. As a result, the appeal of displaying the sole of the foot to the viewer varies from person to person, ranging from eroticism to a kind of innocence. 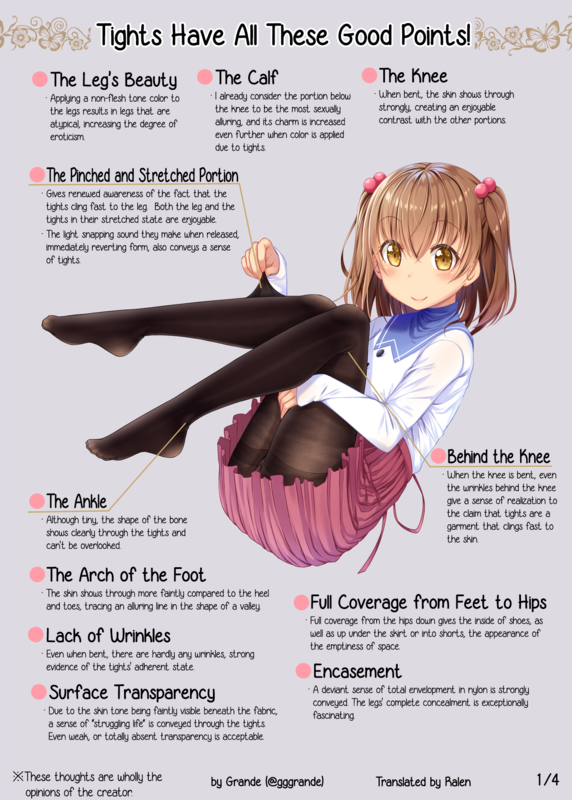 The sole covered in tights (Pixiv tag タイツ足裏, “sole of the foot in tights”) is a sub-interest of the wider phenomenon of girls’ feet covered in any kind of fabric (Pixiv tag ソックス足裏, “sole of the foot in socks”). Recent examples include a scene from the anime Saekano where Utaha is depicted stepping on the camera from a very low angle, and the character Ajax in the mobile phone game Azur Lane, which has resulted in fan depictions of her commonly extending her foot to the viewer. Depending on the fabric and the style of the artist, the toes may be distinguished from the top of the foot, shown only as protrusions from the bottom, or simply not rendered in detail. Opaque tights are seldom shown with reinforced toes unlike sheer pantyhose, possibly to allow the artist to make this choice. As a counterpoint to the appeal of the feet in tights, an aspect not covered in the infographic is the footwear worn with them, which can have an equally distinguishing effect as the tights themselves. The most common shoes seen with tights in Japanese media are high heels, such as those worn by office workers and public service workers, and loafers worn by students. Other footwear seen with tights include boots, which can convey a sense of strength despite covering more of the leg than other types of shoes (see Mash Kyrielite and Gudako from Fate/Grand Order, who wear ankle-high and knee-high boots respectively), and sneakers, which, when worn without socks, can create a slight departure from the traditional femininity associated with tights. As the popularity of tights continues to increase, I have been planning a visual novel that would focus on tights in great detail. Codenamed Project NOV-2, it would be a yuri visual novel that would allow the player to customize every component of each character’s tights at any time, from color to denier to the presence of reinforcing features. The story would focus on two young women with a common interest in tights and the physical sensations that result when two pairs meet. However, due to other obligations, it has to move beyond the planning stage and may not proceed in the foreseeable future. Strict adherence to the content guidelines in “The Day-to-Day of Yuri” by A Kiss For The Petals producer Mi Kara Deta Saba. Pairing contrasts, such as age, skin tone, and, in this case, tights color and denier. Role reversal in intimate scenes. Exploration of as many intimate positions as possible without the use of foreign implements. These would focus on the physical sensation of the tights caused on contact of sensitive areas of the body. In preparation for the project, since 2015, I have been gathering illustrations of girls and women in tights posted to Twitter as reference material for the artists who would work on NOV-2 into a TweetDeck collection. However, the amount of artwork available has grown to such numbers that the collections can no longer be viewed on Twitter properly, as API limits prevent all images from being displayed. As a result, I have started reclassifying the images in the collection to a number of sub-collections by visual elements. The intent of these individual collections is for artists to easily look up specific elements for reference purposes. Images will be sorted into as many applicable categories as possible, so these new collections will largely sort material in reverse order of publication. This also means that I must be more selective with the images I choose to add to these collections, such that the earliest added images do not become inaccessible as they grow. As progress in this endeavor is made, I plan on doing the same to my collection of photographs for reference. Uncategorized: The original NOV-2 collection. Images that cannot be sorted into any of the below categories will remain in this collection. Bodysuit: Tights under swimsuits, leotards, and similar body-fitting garments. Closeup: Very tight closeup emphasizing details, such as shading, lines, and material. Color: Tights in colors other than black. Feet visible: Tights with the feet visible, preferably including the sole. Figures: Photographs of physical figurines and statues. Footwear: Focus on shoes, including high heels, sneakers, and boots that leave a sufficient amount of the legs visible. Front: Tights with crotch area visible as the character faces the viewer. 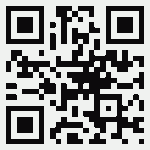 Game: Images from video games and other interactive media. Information: Informative diagrams and tutorials. Middle: Tights with the waistband and midriff visible. No skirt: Tights worn without a skirt. Rear: Tights with the rear visible and unobscured. Seasonal: Images created in observance of a holiday. Uniform: Tights worn with a uniform, such as school, maid, office, public service, etc. Wet: Tights with a distinct shine from moisture. Yuri: Two or more girls, at least one wearing tights, in an intimate scenario. It is my hope that more people are able to understand the appeal of tights in coming years, and more artists provide their own perspectives on how they enhance the appeal of the female form. I would like to contribute to the growing movement myself while its popularity continues to rise, but this will depend on my own success in the visual novel industry.